Today I popped along to the grand opening of Boards & Swords Hobbies – a new bricks-and-mortar games store in Derby. After a slightly false start due to the fact that the store is not readily identifiable from the road (they are hoping to get signage installed soon) we arrived to find the venue already packed with gamers. The venue is on two floors, and provides a surprising amount of gaming space, with approx 20 tables available for wargames, with an additional two dedicated to playing boardgames. The venue provides lots of scenery, plus a modest boardgames library, so you and your opponents can just turn up with your armies and be able to set up on a table with the minimum of hassle. The shop currently has a limited stock, which they are looking to expand as the store grows. The selection currently includes Games Workshop, Infinty, Wild West Exodus, Bolt Action, Flames of War, Test of Honour, X-Wing, Blood and Plunder and Gangs of Rome. 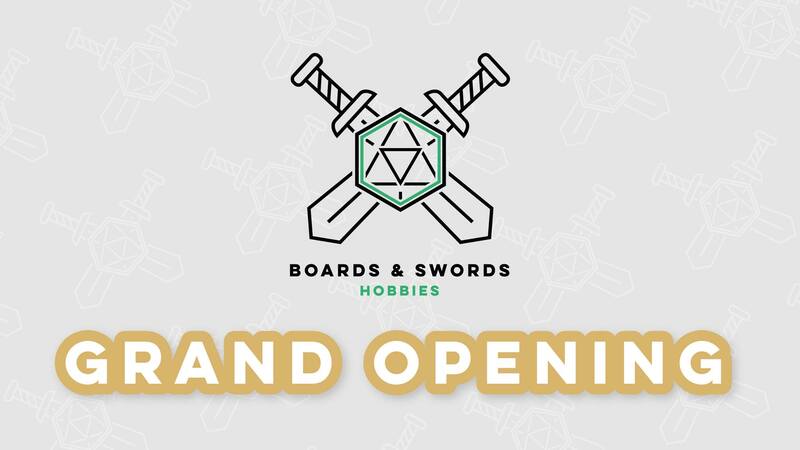 The guys have been working very hard to get Boards & Swords ready, and it’s great to see a new gaming venue opening in the East Midlands. Currently the store will be open late every night in the week for gaming. At a very reasonable £3/player for a table, what’s not to like? My only complaint (and it’s a minor one) is the lack of seating at the gaming tables – and that the upstairs gaming space is slightly cramped – but I’m sure this will get resolved as the venue settles in.